Christian baptism is a sacrament of the Church. Sacraments are sacred practices that carry a pictured meaning. It is one way we testify to Jesus. Baptism represents a great meaning to Christians. In it is the essence of our faith and testimony. Through this sacrament we as disciples of Jesus proclaim our faith in his sacrifice as well as our hope in the resurrection of the dead. It is a commandment of Christ that we do so and is important. Baptism however is not what saves us. There is no method, sacrament, activity, or formula that you can accomplish that will save you. Baptism is merely one of many things that accompany salvation. Let us look at the details from Scripture. 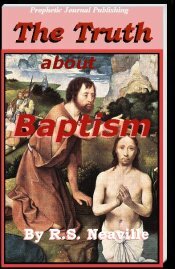 In approaching the subject of baptism we must discern the differences and meanings of various biblical baptisms. There are three of these. The baptism of fire, or the Holy Spirit. John’s baptism as the scripture shows was one of repentance. It symbolized the washing away of sins. This baptism was different than that of Christ for it was an outward cleansing according to law. These washings were detailed in Leviticus chapters 12-15. They made people only ceremonially clean according to the ordinances of the Law of Moses. What are the three biblical baptisms? Where did John get the baptism he practiced? What was the Baptism of John for? Discuss this with the class. Peter tells us that the baptism of Jesus is not the removing of dirt from the body, but the pledge of a clean conscience (spirit) before God. It is about going down into death with Jesus and coming up alive with him to live a new life. Romans 6: 3 Know ye not, that so many of us as were baptized into Jesus Christ were baptized into his death? This is too a baptism of repentance but a deeper and more true repentance of the heart. It is not just a repentance of the flesh which is temporary but also a repentance of the former life we lived in sin once and forever. We through faith go down into the deep of death with Jesus as Peter speaks of him by the Spirit going down into death. And then both spirit and body rise together in a newness of life. This is a testimony before God and men that now we through faith have died with Christ and our hope is to be resurrected with him. It is the sign of Jonah Jesus spoke of to the Pharisees. Matthew 12: 38 Then certain of the scribes and of the Pharisees answered, saying, Master, we would see a sign from thee. As Jonah was in the belly of a whale or big fish for three days after he was cast into the deep, So Jesus was cast into the figurative deep of death. As Jonah was spit up alive on dry land so Jesus ascended back from death. We picture this in our baptism by being immersed into the water which is figurative of death and then we are lifted up as Jesus was resurrected. In this way we identify with Jesus and confess he paid for our sins. We are not just cleansed on the outside as in John’s Baptism but his death and therefore his blood cleanses our insides our consciences. You see what we do as a picture or a testimony through baptism speaks of what already has occurred in our consciences when we receive Jesus as our savior. His blood cleanses our inner man the power of his death on our account. It is not just about the redemption of our body but the redemption of our spirits and even our entire soul. So when we are water baptized into Christ Jesus it is a figure for what has already occurred in our hearts. It is a testimony that now we belong to him who purchased us with his blood. We tell the world of our faith in his sacrifice, our hope in his resurrection, and our acknowledgment of him as our savior and God as our father. It is the testimony of our adoption as his children through Christ Jesus. Whatever is demonstrated in the physical must be first true in the spiritual. Whatever is righteous in our actions or deeds must be first righteous in our hearts. Faith is demonstrated in its works. Where did Jesus go by the Spirit when he died? What does Jesus mean by the “sign of Jonah”? Christians need to understand that it is not the outward baptism that saves them but the inward one. Let us look at the famous verse concerning the thief on the cross. Luke 23: 39. And one of the malefactors which were hanged railed on him, saying, If thou be Christ, save thyself and us. It is easy to see here that salvation was not based on being dunked under the water. It was and is a matter of faith first and foremost. The power of God hits in our hearts first always. It can be demonstrated or manifested or testified to through the outside but is first a matter of the Spirit. What you do demonstrates who you are. Look at what the Apostle Paul had to say concerning baptism and salvation as far as the power of God. The power of God was in the message. The Gospel message we receive in our hearts. That is where the true baptism takes place. When Jesus comes into our hearts he cleanses them. It is the baptism of fire. It is the baptism of Christ. The one portrayed in water is only a picture of the true spiritual one. Notice John referred to the baptism of Jesus as one of fire and the Holy Spirit. He did not mention two water baptisms any more than Jesus told Nicodemus of two physical births. Both spoke of a physical one and a spiritual one. There is one baptism in Christ, and it is the Spirit who performs it. He comes and cleanses our hearts and then indwells them. This is the true baptism of which the water is only a figure. This is why Peter did what he did at Cornelius’ house: He saw the proof that they had received in the heart the truth and so had them water baptized. This is the Baptism that saves. It is when God sends his Spirit to you after you have believed. He gives you this Spirit as a seal of your faith in Christ and the hope of the resurrection. 1 Corinthians 12: 13. For by one Spirit are we all baptized into one body, whether we be Jews or Gentiles, whether we be bond or free; and have been all made to drink into one Spirit. This is the truth about baptism from the scriptures. It is right to be immersed in water in the name of Jesus before men, but that would be useless if it were not true in your heart first. What did John mean by the term “baptism of fire”? Can water baptism save you? Where does the true Baptism take place?